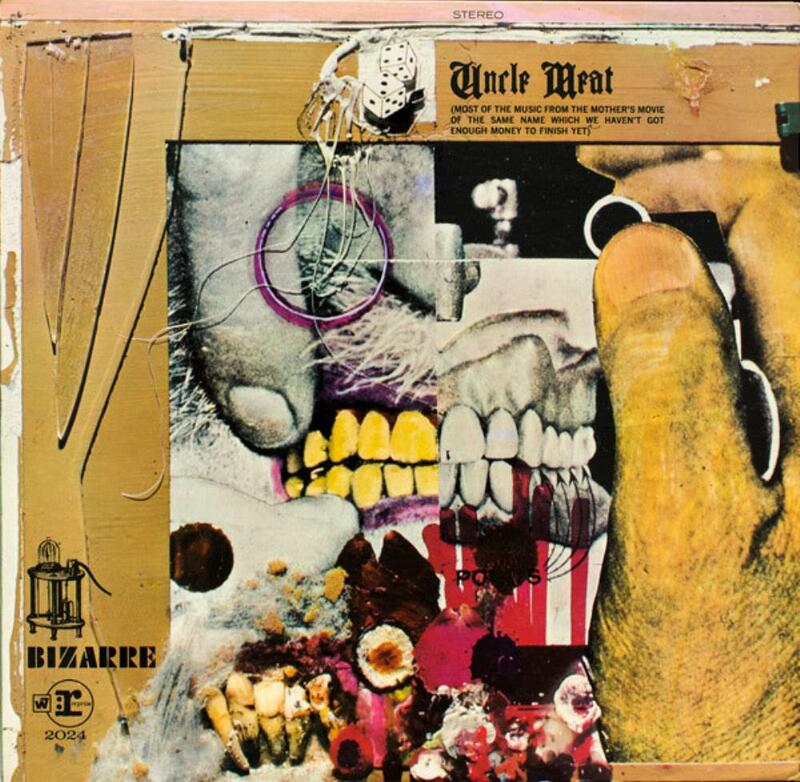 Uncle Meat marks an important part in Zappa’s history as it is the last record to feature the original Mothers in full swing (Weasels Ripped My Flesh and Burnt Weeny Sandwich were considered posthumous releases, as they were mostly comprised of outtakes, not new material). Also, it is the debut of Ruth Underwood on vibes (then Ruth Komanoff), who later became a featured member of Frank’s ensembles into the mid-70’s. In addition, it marked the first time that good Uncle Frank began breaking heavily into the realms of classical and jazz, while still retaining the heavy rhythm and blues and doo wop styles of the earlier records. Lyrically, this album is dense and full of inside jokes and references, sandwiched in between passages graced with trumpets, clarinets, and saxophones. As Frank himself states in the liner notes of the double LP gatefold, this is primarily an instrumental record and meant to serve as a soundtrack to a movie that The Mothers had not yet acquired the money to finish. The opener, “Uncle Meat: Main Theme” is a vibe-led instrumental, backed by harpsicord and some snare work from Jimmy Carl Black, with some instruments that can’t be identified, ending with some of Frank’s sound effects and leading into a conversation with Susie Creamcheese. Suzy, played here by Pamela Zarubica, explains her absence from the last two records, adding to FZ’s “conceptual continuity,” before immediately segueing into “9 Types of Industrial Cheese,” a rare glimpse into Frank’s acoustic guitar stylings. Next is the quirky “Zolar Czakl,” an oddly metered, entirely indescribable piece of music that ends in a brief 45 seconds, before moving onto the screaming sax doo-wop of “Dog Breath, in the Year of the Plague,” which is genre-defying in its own way, breaking into some high-pitched vocals, and into some heavy classical in the middle section. As I’m sure you can tell, the music is utterly stunning and completely unlike anything heard before, either by contemporary music or Zappa himself. “The Legend of the Golden Arches” is a Frank Zappa classic, played for years by the man himself in various lineups, even by his classically-inclined Ensemble Modern on The Yellow Shark (1993). The mid section is where the “Meat” is; Ian Underwood’s screaming clarinet is out of this world and full of some of the most passionate playing on a Frank Zappa album ever, before breaking into some harpsichord dissonance. The album slows down a bit with “Louie Louie”, which provides some laughs as the Mothers distort the classic at The Royal Albert Hall, before moving onto “The Dog Breath Variations,” one of Zappa’s favorite compositions. Instrumentally speaking, it’s more of the same, but the music is unbelievable. You must get this to understand just how unique this is! “Sleeping in a Jar” is The Mothers at their most haunting, with a distant trumpet-sound soloing above–again under 45 seconds. After some more talking, the music moves onto “The Uncle Meat Variations,” with more harpsichord and some munchkin voices. Hilarious and brilliant at the same time, this is my favorite composition of the album, which breaks into a guitar solo near the end and ends in an epic way with bold drum rolls and bluesy guitar. Very, very cool. “Electric Aunt Jemima” is more surrealism and high voices, and is a bit of a novelty song, admittedly, but has some trademark Zappa experimentation throughout. I absolutely love it. After some hilarious banter, “Prelude to King Kong” bursts from your speakers with some fast paced avant-jazz from Ian Underwood on sax. After “God Bless America” at its most dissonant (more conceptual continuity), there is some scattered percussion, not unlike Gong’s “Percolations” and moving onto “A Pound for a Brown,” which is a faster-paced version of “Golden Arches” with some differences in instrumentation. “Project X” is some excellent avant-garde, before leading into some really chill-inducing music. “Cruisin’ For Burgers” is weird, very surreal, and beautiful. Some of my favorite Mothers’ music ever. And to think, all of this creativity and not an ounce of drugs involved. It’s amazing and ends Side 3 perfectly, before moving onto Side 4… Side 4 is the subject of another Frank Zappa classic, the 18 minute jazz odyssey, “King Kong.” In many ways, it’s as threatening and monstrous as its namesake, with a bombastic head, leading to numerous solos from within the band. Everything is covered here: there’s another Underwood solo, a Don Preston electric piano solo, and something that almost sounds like an electric kazoo! The whole thing comes to a thrilling conclusion in a live performance where the band rocks out “on a flat bed diesel in the middle of a race track at a Miami Pop Festival,” and comes apart at the end. It doesn’t end, it falls apart, like the great beast himself, shot from the Empire State Building, very much a way to describe the end of the mammoth double set itself. Overall, Uncle Meat is a challenging, eclectic listen, full of a myriad of twists and turns that leave an involved listener on the edge of his or her seat and breathless at the conclusion. The experience is unique to say the least, unforgettable, and one that I am happy to return to, time and time again. I can say with utmost certainty that Uncle Meat is essential to any experimental-music fan or Prog lover’s collection, and an album that no self-respecting Zappa fan can be without.